I can’t believe that it’s already October. The cool weather is really settling in Brooklyn and I’m pulling out the scarves, jackets, and hot cups of tea. It’s my favorite time of the year and it’s also the perfect reason to go out and read (more than I usually do). P.S. I Like You by Kasie West (5/5 stars) – I got this book in my Owlcrate box in August, but haven’t had the chance to read it until now. This was such a sweet little read. I love doing “in-betweeners,” which are books that you read to separate out some of the more heavy and serious reads. Not to say that this book isn’t serious. It’s the kind of book that doesn’t remind you of the strife and struggle of reality. I don’t know if you deal with this kind of thing, but when I read too many serious books I get some serious anxiety about life. When you’re so enveloped by a book, you forget what’s reality and what’s the fiction and in those situations, the anxiety is real. If you haven’t felt anxiety after reading a serious book then you’ve got a stronger mind than me. 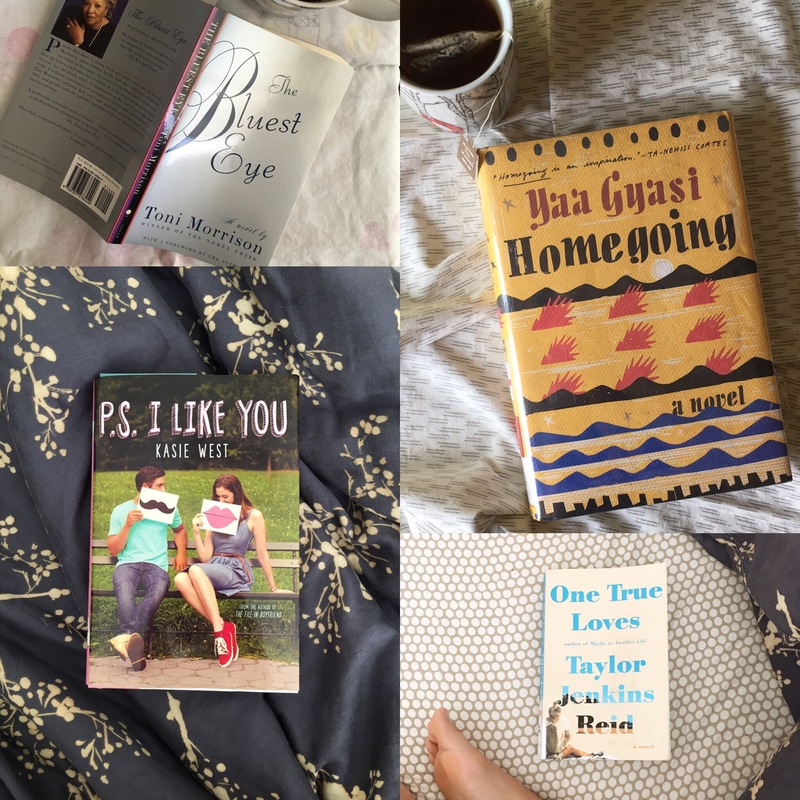 One True Loves by Taylor Jenkins Reid (4.5/5 stars) – I was reading One True Loves as another “in-betweener” because I wasn’t ready to read something serious yet. However, as I got into it, I realized that this was a bit more serious. Dead husbands and finding love and finding old loves again. Those kinds of conversations are reserved for the reality of the world and not the fun world of “in-betweeners.” But I fell in love with this book the way Emma, the main character, fell in love twice. No spoilers here, but it’s really difficult to choose someone you want to be with when you have feelings for more than one person. I will keep the rest to myself, but I strongly suggest this book. Homegoing by Yaa Gyasi (5/5 stars) – Alright, when I talk about serious books, this is a serious book. However, it’s an important book and something I think everyone should read. If you’ve ever asked yourself what your ethnicity and heritage/background is, then you should read this book. Coming from a very family-centric environment, it was frustrating for me to read about a family lineage where it gets so muddled because of something as barbaric as slavery and war. It reminds me of the Syrian refugees ripped from their families and their homes. I think with modern technology they may be able to be together again, but back in the 19th century, that wasn’t an option. It brings a sad tear to my eye knowing that some families will never be together again. Everyone should read this if only to value the families they have. The Bluest Eye by Toni Morrison (4/5 stars) – I read this one for Banned Books Week. There is something about Toni Morrison’s voice that compels me to read more and pushes me away from her. Her words are haunting and visceral like looking at a surrealist painting. The Bluest Eye is the first novel she’s published and if you’ve ever struggled with your own identity and accepting who you are, then you should definitely read this book. In the end, the moral of the story is that you shouldn’t struggle to try and be something you’re not. Love yourself for who you are and enjoy your youth as much as you can.